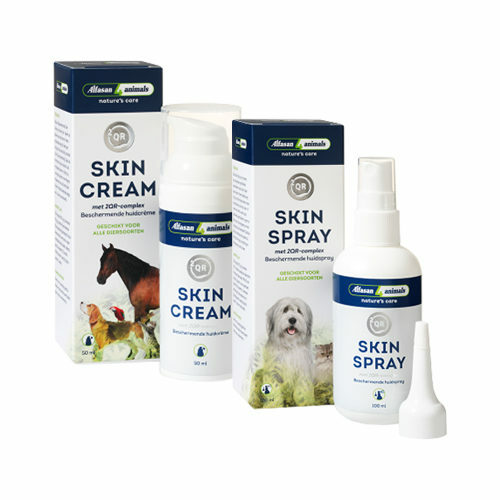 Alfasan Skin is suitable for all animals and supports the healing of sensitive skin. You can also use it when your pet's skin is red, sensitive or irritate, also when this is the result of insect bites. Available as a spray or a cream. Alfasan Skin supports the regenerative capacity of the skin. It strengthens the natural skin flora by protecting the right balance of detrimental and beneficial micro-organisms. The product also has a soothing effect on irritated skin. The main ingredient is natural and is obtained from a plant (Aloe Barbadensis). Skin cream: suitable for small (bare) spots. You can apply the Skin spray directly from the spray bottle onto the skin in a striped pattern and massage it into the skin. If the coat or feathers are too close, you can use the screw cap with dispensing spout to get closer to the skin. You can apply the Skin cream directly to the skin with your fingertips and massage it into the skin. Please clean and dry te skin before applying the cream. Alfasan Skin is absorbed quickly, but please make sure your pet is not able to lick the treated area until the substance has been fully absorbed. If the bottle accidentally comes into contact with the skin, clean it with a disinfectant. With the Alfasan Cream, it may be necessary to press a few times before the cream comes free. Apply twice daily, or more often as needed. Please consult your veterinarian if the complaints continue. The colour may vary from white to light brown. This is due to the time and circumstances when the plant material is harvested. Store the spray below 25 degrees Celsius, but not in the fridge or freezer. After opening the package, it may be used for 6 months. Skin spray: 2QR-complex (70% g/g), vitamin A/C/Ecomplex, bisabolol and allantoin on a spray basis (water, PPG-15 stearyl ether, glycerine, coco-caprylate, steareth-100, steareth-2, mannan, xanthan gum, fenoxyethanol, ethylhexylglycerine, caprylyl glycol, laureth-9, sodium hydroxyde). Skin cream: 2QR-complex (70% g/g), zinc-oxide (5% g/g), panthenol en allantoin on an oil-in-water cream base (decyl oleate, cetearyl alcohol, ceteareth-20, lanolin, phenethyl alcohol, caprylyl glycol, laureth-9, water). Have you used Alfasan Skin before? Let us know what you think about this product.